Sands Befrienders play a vital role in offering support to bereaved families throughout the UK. Many of us know first-hand how much comfort and support a Befriender can give. The reassurance of talking to someone else who has been affected by the death of a baby and who is nearby to phone or to meet in a group is invaluable. Sands is very proud to be able to offer this service and we are hugely grateful to the many volunteers around the country on whom the service relies. Are you ready to befriend? Befriending is an emotionally demanding role, and both you and we need to be sure you are ready to take it on and have suitable support yourself. If befriending isn’t right for you at this time, that’s ok. If you want, you can get involved in other ways, and you can of course continue to access support for as long as you need it. To help us decide with you whether you are ready to befriend, we have a number of checks in place that we will take you through. At least two years should have elapsed since your own bereavement . Many of our volunteers tell us that they had no idea how the first anniversaries would affect them until it happened. Our application form will also ask for two referees, and we will need satisfactory references before you start befriending. The references can be from someone who has known you in a personal or professional capacity for at least two years but not a family member or close friend. One of them will need to be known to you outside of Sands. We will ask them to comment on your suitability to be a befriender. During the pre-course period we contact your local Group to seek confirmation you have attended their support meetings. We will ask the befrienders in the Group whether they feel you have reached a point where you might be ready to offer support to others. We will set up an informal chat for you with Lesley Dewar, our Befriender Training Coordinator. Lesley will be able to give you much more information about the training, and help you to decide if you are ready to commit to what can be a challenging two days. Sometimes a training course will throw up some concerns about your readiness to befriend. We might need to have a follow-up call with you to discuss certain points, to set up certain special arrangements, or to let you know that this is not the right time for you to start befriending. This is not a failure. It is important for our befrienders, and for anyone they might support, that they are in the right place emotionally. If you are not there at the present time, it is better to focus on other ways to make a difference for other bereaved families, and maybe come back to befriending at another time. Once you have successfully completed the course, and we have agreed you are ready to befriend, with satisfactory references, we will let your Group know that you are now ready to start befriending with them, on a trial basis. Your probation period will last until you have successfully completed Befriender Training Part 2. After six months you will need to book onto a part 2 training course. At that point we will review how your befriending has been going, answer any questions you have based on your experience, and hopefully confirm your probation period is completed. 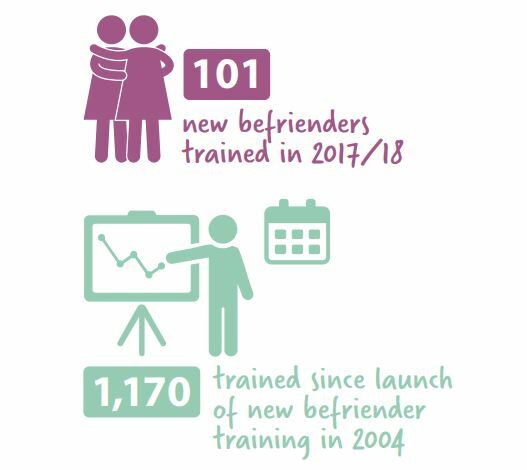 All befrienders need to be regularly reflecting about their role, identifying areas for learning and development, and our part 2 training courses are open to all befrienders at any time. Our training programme consists of 2 courses: Part One and Part Two. "I didn't realise how much support I would get from the rest of the group and Sands." Our training days are very interactive, with exercises carried out in pairs and small groups, as well as the group as a whole. Courses are run at locations around the UK and each day runs from 10am to 4.30pm. Dates and venues are advertised through local Groups, on our website below and Facebook. This two day course enables participants to develop their befriending skills. In particular they will learn how to build a safe and trusting environment in which anyone affected by the death of a baby feels supported and able to explore and express their feelings. "The training has given me the courage and confidence to befriend." At the end of this course not only will the facilitators of the training be able to decide if an individual is ready to befriend, but you too will be challenged to decide if you feel ready. Part 2 befriender training course details will be released soon. To request a large print version of the form, please contact befriendertraining@sands.org.uk, or call the office on 0207 436 7940. Keep checking here for further dates. This is a one day course which Sands Befrienders are expected to attend once they have some experience of befriending through a Sands Group, approximately six months after their part one training. At the end of this course participants will have had an opportunity to reflect on their experiences as a Befriender and explore the more advanced aspects of the role. Part Two Training is open to individuals who have already completed Part One Training and have been befriending for at least six months. Watch this space for Part 2 befriender training dates for 2019.